What Is the 2017 Version of Azure API Management Service? 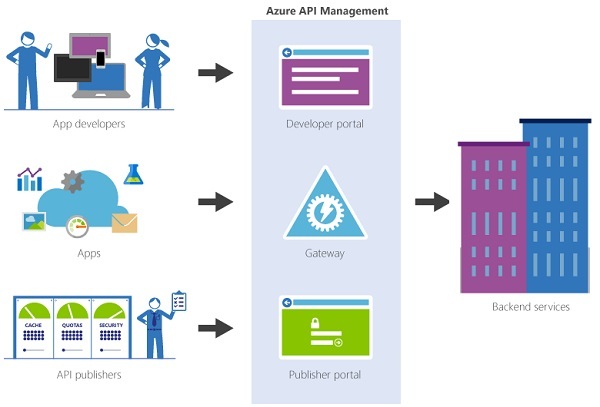 The 2017 Version of Azure API Management as a turnkey solution for publishing APIs to external and internal customers. Quickly create consistent and modern API gateways for existing back-end services hosted anywhere, secure and protect them from abuse and overuse, and get insights into usage and health. Plus, automate and scale developer onboarding to help get your API program up and running. 1. Publisher Portal - The publisher portal is the Web portal for you to create and manage your API services. 2. Gateway - The Gateway is the Azure server where your API services will be served to client applications. 3. Developer Portal - The Developer Portal is the Web portal for developers of client apps to learn and run tests on your API services.